For many small and mid-sized exhibitors, traveling to distant trade shows to expand their reach seems like a cost-prohibitive idea. It’s definitely a big step and a serious investment, so it’s important that those companies get a considerable return on their investment. If you’re going to send a team to a distant show, you need to make a big impression. Shipping a large exhibit across the country, or internationally probably is cost-prohibitive for all but large companies. Thankfully, portable displays has come a long way, and using it no longer means you’ll be putting up a second-rate exhibit. In fact, if you choose carefully, you can create a full-featured, premium quality exhibit using portable pieces. There’s a huge range of quality in the components of portable displays, and there are a few things to watch out for when you select yours. Be sure you’re getting pieces that are top quality, well designed for easy use and constructed to last, and be sure the printing is high quality. You want to see crisp images; clear, bold colors; and clean, hard lines. If you look at samples from a manufacturer and the print quality is not top-shelf, shop on. Your visual branding is of critical importance and it needs to be as close to perfect as possible in your trade show display. One last point to consider is how small the pieces you’re considering can be packed down, and how much they weigh. Pieces that fit into a standard suitcase are easier to transport on a passenger plane than larger pieces, which may have to be sent separately. Banner Stands- Banner stands are not just for individual use. If you choose stands that are designed for use as part of a system, you can assemble a beautiful back-wall in minutes, complete with lights. A well-designed system can be assembled by one person, and shouldn’t require tools. Many systems include a hard-side travel case for the stand, which you can use for storage or as a table in your booth later. Ask about accessories like shelves, monitor mounts, workstations, and literature racks; if you need those features, you want to make sure you’re buying into a system that supports them. 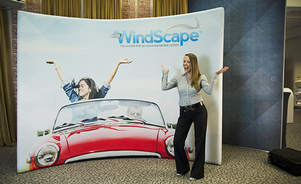 Inflatable- Premium inflatables offer a bigger range of display pieces, and give you enough options to build a full-scale exhibit, complete with towers and hanging structures to give you maximum visibility and exposure. Most inflatable pieces can be deployed and situated by one or two people in a short time, without professional assistance. An Inflatable display is the most compact to ship, with most pieces packing down into a suitcase or even a carry-on. Pop-Up- Pop-up displays offer a simple way to exhibit a single-panel back-wall, and many offer the option of back-lighting, which makes your exhibit stand out dramatically. Depending on the frame style you choose, a pop-up can be assembled by one or two people; premium features include self-locking connectors. The top-of-the-line frame material is carbon fiber, which is extremely durable and lightweight, but it’s also fairly expensive. Fiberglass offers a good balance between cost and durability, and it’s still fairly lightweight. Aluminum frames are the least expensive to purchase, but they’re the least durable material, and they’re also heavier, so you may spend more to ship them from show to show. Anyone who has traveled has probably run into unexpected challenges. Your suitcase shows up in Atlanta, when you’ve arrived in Houston, or your precious cargo was damaged with toothpaste smeared all over a weeks worth of clothes (true story.) These travel hiccups have the potential to play out when you travel to distant trade shows. This is why it’s so important to work with a company that has a global presence, and can be there to assist you if you need help throughout your show.